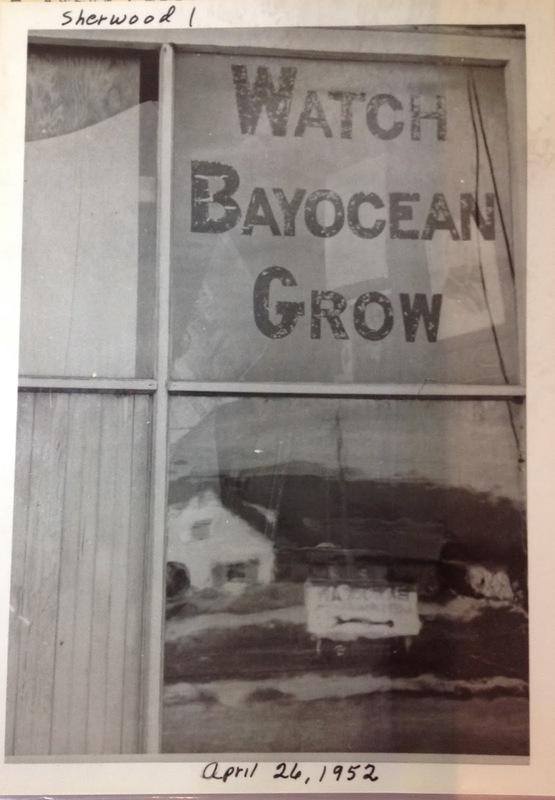 On November 13, 1952 a severe winter storm ripped a 3/4 mile wide gap into Bayocean Spit, isolating the town center on an island. 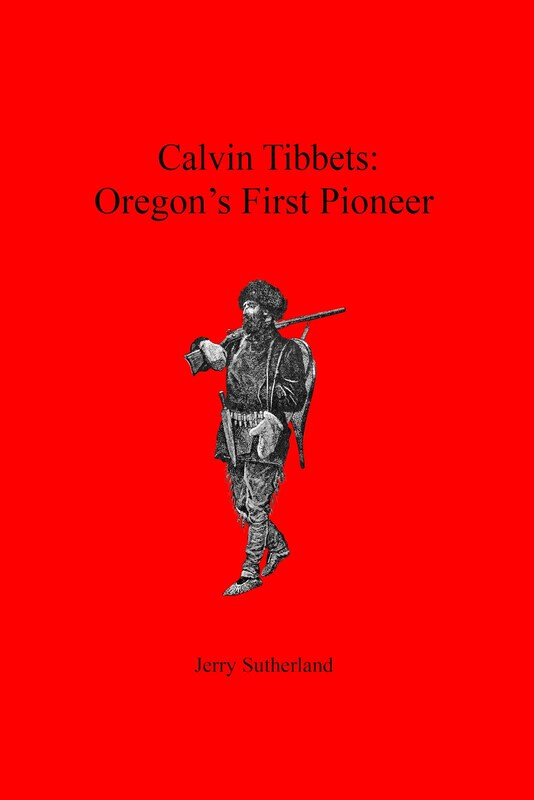 Soon after that, the Oregonian sent William Lambert to cover the story with photographer W. Kirk Braun. The article filled page 32 and part of part 33 in the November 23, 1953 edition. 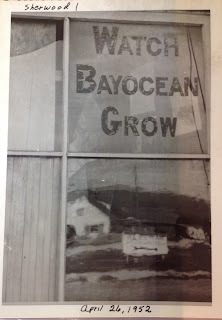 In one of the photos Lambert changed the sign in Mitchell's General Store window from "Watch Bayocean Grow" to "Watch Bayocean Go" by covering up a couple letters. He may have thought it ironic, but it must have greatly distressed Francis Mitchell. He was known to be such a strident supporter of Bayocean that I'm surprised he let it happen, even at the age of 83. He must have been there, because he and his wife Ida were two of the eight residents who stayed on the island after the breach. I've chosen to include the original sign out of respect to them. Mitchell was one of the first to buy into the Bayocean dream and never let go of it. He would bend anyone's ear about Bayocean - even the children who lived there. One of them, Perry Reeder, recalls "Mr. Mitchell" stopping them each morning on the way to school, or at the bus stop, to preach about his political views and plans to make Bayocean great once again. The only thing that could tear Mr. Mitchell from Bayocean was Mrs. Mitchell. On October 22, 1953, the Tillamook Headlight Herald reported that she'd suffered a stroke on the 18th, and that after frantic efforts by islanders to send a signal, she was transferred to the Tillamook Hospital the next day with the help of folks on Cape Meares and the Coast Guard. 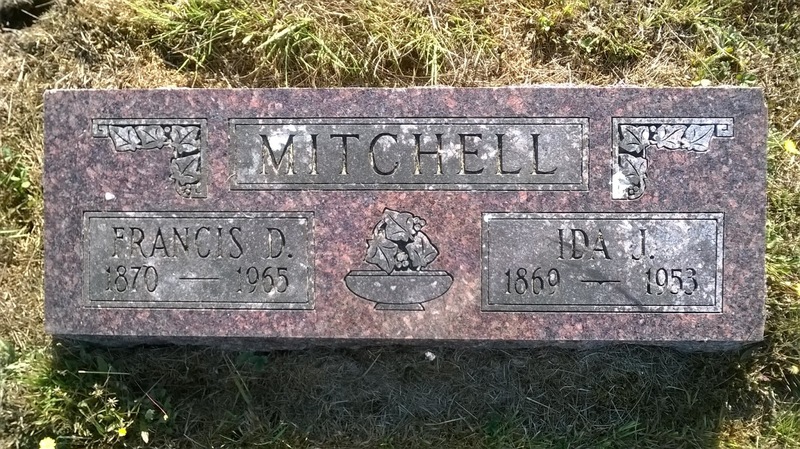 According to the Tillamook Headlight Herald of November 5, 1953, Mr. Mitchell spent his nights with friends on Cape Meares to remain as close as possible to Bayocean, but spent each day in Tillamook to be near his wife, who was not doing well. 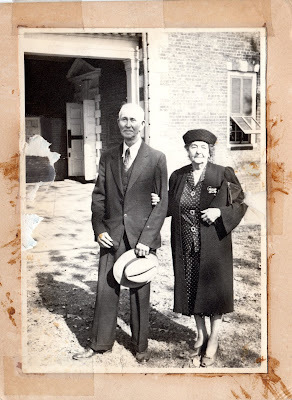 He'd only leave her side to wander about town and preach to folks at the courthouse, newspaper office, on the sidewalks, and in stores, as he had the children of Bayocean. But on the 4th he evidently got so carried away in an exchange with the sheriff that he was taken into custody and judged insane the very same day. The next edition said he was taken to the Oregon State Hospital on November 7. 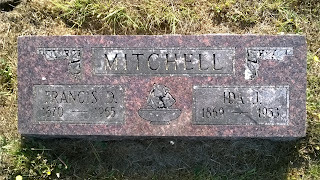 Mrs. Mitchell died December 28. Six years later, on October 22, 1959, Mr. Mitchell notified the editor of the Tillamook Headlight Herald of his move to Ward 2 so that he could continue receiving the paper. He complimented Mrs. De Cook for her work with Judge Effenberger to increase Tillamook tourism, adding that if folks had taken his advice about that in the past, "Bayocean would have been a success." 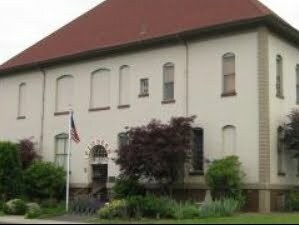 I'm sure Mr. Mitchell's fellow residents at the Oregon State Hospital heard about Bayocean every day until July 25, 1965. Only death could kill his dream and stop his preaching on it. November 11, 1965, and had it placed at Spaces 1 and 2 of Lot 79 in Block 4 of the Tillamook IOOF Cemetery. Ashes of more than 3000 inmates remain unclaimed at the Oregon State Hospital.